"Thoughts of greed, hate, venom, gentleness, and kindliness change the type and modify the breath-form for the time during which the thinking goes on, as a face is changed by love or anger. A thought, when issued, has a certain sound (vibrational frequency) that being equivalent of a form. That sounding causes physical matter to collect in the form of rock, plant, or animal." We truly do need to be attentive to the thoughts we allow to take up residence in our minds. We are not our thoughts, nor are they us, but they take on a life of their own. When we add emotion to our thoughts we most especially give them powers beyond a stray idea that floats through one's awareness. "Thoughts are 'issued' by the (use of) word, speech." This clearly states that once we raise the vibrational frequency of an idea to speak it aloud, it takes on form: thought-form. Thoughts that are continually entertained in your mind are fed your attention, your energy, and are recognized by other sentient beings. Quantum physics defines the smallest quantity of consciousness as an ATOM. Atoms are aware of you and are affected by your thoughts. 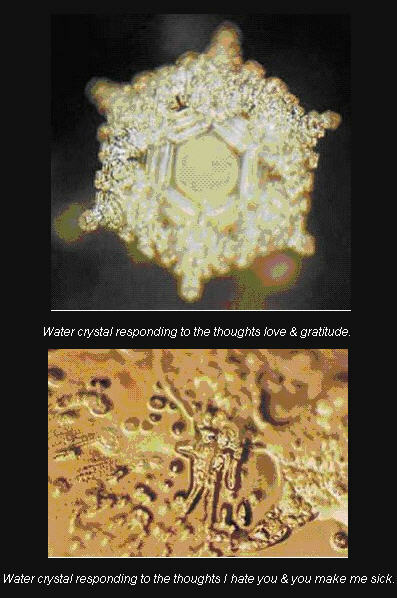 Masaru Emoto has proven this with his work with water (see his book, The Hidden Message in Water). As humans are made of 70-90% water, every thought we have vibrates through our own water in our own bodies. When you say things like, "I'm so stupid," "I'm dying to...", or "Please don't hate me, but..." your body/mind hears you. (Yes, your entire body makes up your mind. Those cells are all busy doing their jobs, duplicating themselves, dying off, etc. without direction from your brain). Please be aware of the thoughts you think and the words you say - most especially to those you love, like your family, friends, pets, home, and car. Speak only the best news or, as Thumper's daddy said, "Don't say nothing at all." It is by no coincidence that the words of John 1:1 in the Bible are "In the beginning was the Word, and the Word was with God, and the Word was God." Any statement you begin with "I am..." creates your reality. Think twice before you add sick, tired, dying, etc. To learn more about Emoto's work with water, click here to watch a video on YouTube.